The Art of Living Foundation is an international Non-Governmental Organization (NGO) in special consultative status with the Economic and Social Council (ECOSOC) of the United Nations. The Art of Living Foundation is an international nonprofit educational, charitable, and humanitarian foundation, dedicated to serving society by strengthening the individual. Art of Living’s educational and self development programs offer techniques to eliminate stress, improve health, expand awareness and resolve conflict and have been enjoyed by millions of people in over 150 countries. As a Non-Governmental Organization (NGO), the foundation works in special consultative status with the Economic and Social Council (ECOSOC) of the United Nations, participating in a variety of committees and activities relating to health and conflict resolution. The Foundation has accredited representatives at the United Nations in New York, Geneva and Vienna. The Art of Living Foundation is run almost exclusively by dedicated volunteers cutting across all beliefs and cultural boundaries. 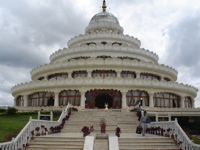 The Foundation was founded by His Holiness Sri Sri Ravi Shankar in 1981. The Art of Living Foundation presence in Hong Kong began in 1992. It has actively served the community by regularly holding the Art of Living Courses and other related activities. In August 2003, a full-time Centre was established to meet the growing demands of the community. Courses and related activities are now regularly held at the Centre. The Centre is constantly addressing the needs of the community. It has expanded its teaching faculty by having more resident teachers and types of courses on offer. This enables the Centre to address the varying needs of the community across a diverse range of age groups. The Centre also receives regular visits from senior teachers based at our international headquarters in Bangalore and from across the globe. These visits usually coincide with courses where they participate as instructors. The Center has been graced by the visits of His Holiness Sri Sri Ravi Shankar in 1998, 2001, 2004 and 2006.